John Boyett is a multifamily investment professional at Matthews Real Estate Investment Services™. Through in-depth market knowledge and meticulous pricing strategy, John helps his clients achieve their investment goals with the disposition and acquisition of Multifamily income properties nationwide. Coming from a family of multifamily investors, John is better able to understand his clientele and find solutions that suit their needs. He leverages his advertising and business background to provide the highest level of advisory service, paired with an unrelenting work ethic, ensuring clients receive an exceptional experience. 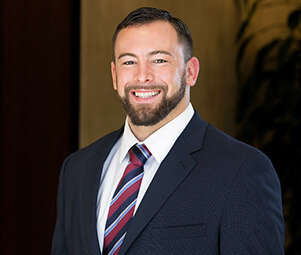 Whether advising a client through a 1031 exchange or bringing an asset to market, John thrives on redefining client expectations by improving their investment position. Prior to joining Matthews™, John played several seasons with the Indianapolis Colts and the Denver Broncos in the National Football League (NFL). He later joined the Ottawa Redblacks in the Canada Football League (CFL). Through his career with the NFL and the CFL, John has built and maintained many deep business relationships and learned to overcome obstacles. His innate drive and relentless work ethic have carried over into his professional endeavors for his clients.